​​Mumbai City FC moved to the second spot in ​Indian Super League standings with a comfortable 2-0 win over a struggling Chennaiyin FC side. Goals from Raynier Fernandes and Modou Sougou were enough to hand the Islanders all three points at the Mumbai Football Arena. 512 minutes without a goal this campaign for Jeje Lalpekhlua and John Gregory finally lost his patience again with the Mizo striker. After starting four games on the trot, he returned to the bench for the fifth time in Chennaiyin's 11th game of the campaign as Carlos Salom who is equally out of form, lead the line. From the narrow 2-3 loss to ATK, there were two more changes for the Machans. Tondonba and Thapa came in as Orlandi dropped to the bench and Jerry Lalrinzuala, woefully out of form, was kept out of the matchday squad altogether. Mumbai started with Sougou, Issoko and Bastos up front. Raynier, Sehnaj and Machado were instated in a three man midfield. The Islanders' defence consisted of Sauvik, Goian, Lourenco and Subhasish Bose. Before #MUMCHE kicks-off, here's a look at the team sheets yet again! Both teams started the game cautiously, testing each others' defences and trying to find loopholes in their respective opponents' teams. The first real chance of the game came in the 27th minute and it resulted in a goal for Mumbai City FC. Rafael Bastos from the left side made a quick sprint and then passed the ball to Raynier Fernandes who was in some space. He let loose a shot all along the ground and placed it beautifully to the right of Sanjiban Ghosh who made a despairing dive but could not reach it. The ball rolled into the back of the net and the home crowd was up on its feet as the Islanders took a 1-0 lead. 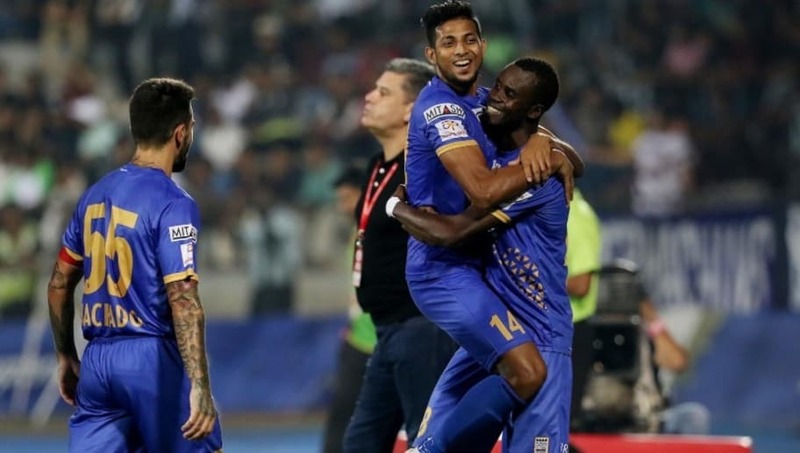 Mumbai almost doubled their lead on the stroke of half-time as Modou Sougou struck the post courtesy of a mistake in defence by Chennaiyin's Mailson Alves. Just 10 minutes into the second half, Mumbai City doubled their lead courtesy of the in-form Modou Sougou. Rafael Bastos made a stunning run all the way from the half-way line till just outside the Chennaiyin FC's box. His shot was blocked by the trailing foot of Eli Sabia. Unfortunately for the defender, the ball went directly on to the head of Modou Sougou, who had to just nod into a wide open net to hand Mumbai a two goal advantage in the 55th minute. 55' GOOOOOAAAAAALLLLLLLL!!!!! @papesougou doubles our lead at the Arena after some brilliant work from Rafael Bastos to create the opportunity. Chennaiyin tried to create some chances for the rest of the second half but Amrinder Singh was equal to all of their attempts on Mumbai City FC's goal as the Indian goalkeeper pulled off some great saves to keep his side's clean sheet. Needless to say, Mumbai's defence has been quite brilliant too. With this win, the Islanders head to the second spot in the Indian Super League table as things look brilliant for Jorge Costa's side this season. They are on 20 points from 10 games, one ahead of Northeast United and three ahead of FC Goa, who have a game in hand. Bengaluru FC lead the league on 23 points. The Islanders will face their toughest test in the ISL this season when they travel south to face the Blues from Bengaluru on December 9. Chennaiyin, meanwhile remain on five points from 11 games and could go bottom of the table if FC Pune City and Delhi Dynamos gain points from their next game.